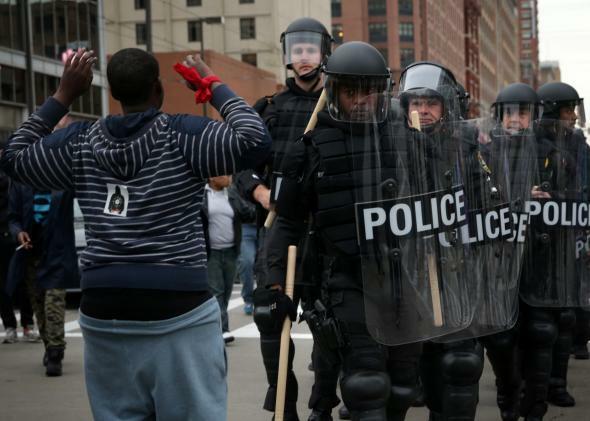 Baltimore police beat up City Paper photographer at Freddie Gray protest. A protester holds up his hands as police in riot gear pass through during a march in honor of Freddie Gray on April 25, 2015 in Baltimore. “They mobilized,” [Giordano] says. The police line moved forward and Giordano did not move fast enough for them. “I always move at the last second,” he says. Five or six police officers in riot gear hit Giordano and the other protester with their shields, knocking them to the ground. On Sunday, Woods took to Twitter to deny reports that police tackled Giordano to protect him from an attempted robbery. 2. @BaltimorePolice @jmgpix if you've heard people say that, please don't share it. It is false.